Only recently joined this forum, I checked the site for Stornaway barracks Lemgo (previosly known as Spiegleberg Kasserne) to see if my old unit got a mention, it did not, my unit was 14th ARMY SIGNAL REGT it took over there in April 1955 and stayed there until dissbanded in late 1958, it was a full 4 squadron regement and took over the entire garrison except for 1 ASSU Squadron which was there when we arrived and still there when we left. I can only guess why it is not mentioned in the history of Stornaway it was set up as the signal regt for an Army that did not exsist (or at least had not exsisted since 1945) CO was Lt Col A.C.Cox OBE (George to his fellow officers) Adj was Capt J.R.Gibson. Could whoever administers the site include this unit in the list of occupiers, there might still be a few alive who remember it. 14 Army Signal Regiment formed Stornoway Barracks Lemgo 1955, it was joined by the Lubbecke District Signal Squadron (which had been 3 Squadron/19 Army Group Signal Regiment). The regiment is not listed after 1957"
Hello, I'm looking for my grandfather on my mother's side. I know he was stationed in Lemgo in 1945, where he met my grandmother Klara Watermann. She lived with her 4 sisters in Lage, only 5 miles away from the Stornoway Barracks in Lemgo. She never revealed his name to my mother. The only detail she revealed was that he was tall and had black hair. Well you have set the bar high! The person, if still alive, and was 17 yrs old or more will be 90 yrs old now! Some of our members specialise in the history of where and when a unit might have been early post war in 1945, which maybe helpful? Now comes the hard part of researching for a named person. Even with a name and unit, tracing that person would be difficult, but with neither unit name or named person makes, as you already realise is nigh on impossible! That said, we now have your search details in print here. Many people will read it. From your family side, the name of the tall black haired person we presume will never be known! Was there ever any mail correspondance at all? Maybe someone reading your search here, might put two and two together and realise that there was talk in the family which links to yours? I wish you success! Should you wish to send any personal information. A pm can be sent to me via the icon shown below this message. 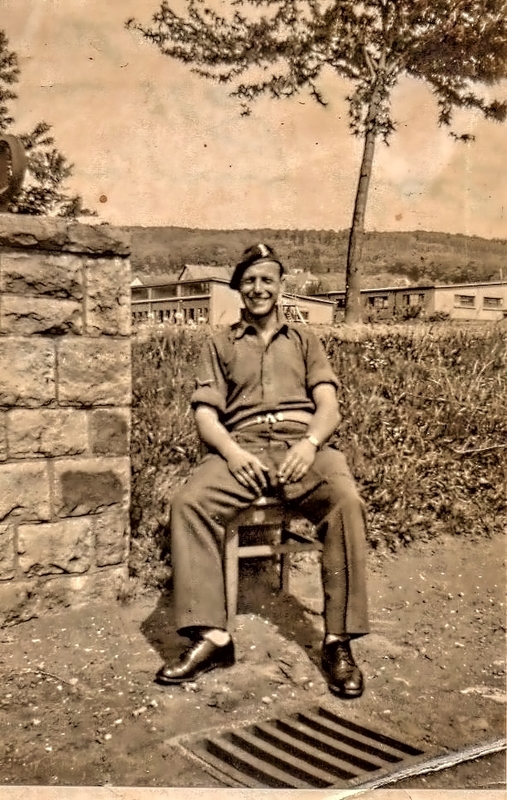 hello I am from germany and looking for details from soldier Sydney Walker he was stationed there in 1946 on the photo you can recognize an eagle wing in a soft unit he had been?